Translated from the Latin to every day language, Go for it! Seize the Day! We went for it last night when we realized there was a trio of Irish bands entertaining at Hotel Gander. There was a snowmobile festival, Snowfari with 400 participants registered from all over the province. On a whim, we decided to go out and it turned into a fun and social night. We were joined by great people from Gander and a new friend to Gander and we had lots of visit, laughter and dances until the week hours. We were home before 2 a.m. (depending on which clock you checked) and I crawled in bed around 3 which is a rarity these days, having outgrown many of my earlier habits. I was just settling into my first coffee when I had this message in my inbox. My friend Trace is honorary Vice President to my imaginary Newfoundland Iceberg Reports empire. Living in Lumsden and an avid birder, she is often out and about and has been my spotter on the beautiful straight shore. 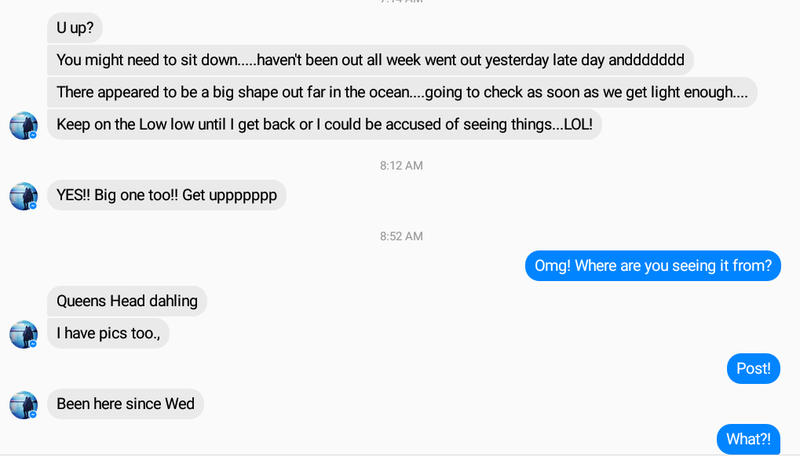 We met on Facebook in discussions about iceberg photos and one thing lead to another. In private messages over the past 3 or 4 years we have shared laughter and drama as we coached each other through technology issues, family issues and wellness issues. We probaby know a bit too much about each other for people who have never actualy met. We laugh and tease and torment each other and cheerlead too for our various projects and adventures. I cornered her. Got her phone number and finally figured out where she lives! It was probably time actually because Leo and I were both still in bed when we had our first Facebook voice call with her today. Can’t get more friendly than that. She told us to watch for the iceberg coming from Musgrave and to call her from there. I had finished my grocery list before starting to check Facebook so that went to the bottom of the purse and we grabbed a quick Gander Bread Box and Café breakfast and we were on the road by 10 a.m.
We took a quick peak in Carmenville and realized our friends boats were not on the usual wharf. A long zoom showed all was well across the harbour. We didn’t stop to talk to this guy but Leo said maybe in the spring when it wasn’t so chilly. We took a turn down into Musgrave Harbour to see if there was an sign of the iceberg from that area. We did get to see and hear this awesome sight. They were quite chatty so I’m sure they’d seen the iceberg go by a couple of days ago and were wondering what took us so long. At the wharf, the breakwater blocks most views to the water but we did see a small boat working it’s way in to the wharf. There was another man in a pick up truck watching the happenings, and I’m guessing hanging around to make sure all ended well. For sure, these guys were takin’ chances. We called Trace on the way out of Musgrave Harbour and kept our eyes peeled for our iceberg. It didn’t take long to see it. No zoom iceberg could be seen on the horizon. A beauty! According to our early morning briefing, it may be grounded on a shoal and has been there since a blizzard on Febrary 15, 2017. Driving along the highway I got Leo to stop so I could try a few more shots. The sun didn’t actually hit the iceberg but it was sunny enough to get good water and sky contrast. It was also crazy windy and the spindrift could be seen on the huge waves coming in. At Anchor Brook there was lots of opportunity for water and both fresh water and salt water ice….if you didn’t freeze to death. By the time we made it to Lumsden we were enjoying blue skies and the exhilaration of seeing and iceberg. Trace had indeed given me her actual address and we just feel into conversation as though we hadn’t seen each other in ages. Pretty neat since we’d never met before! We saw her iceberg pictures that she’s posted while we were on the road and visited for over an hour, leaving with a big hug and a roast of moose! As we were pulling out of the driveway, she waved us back and passsed me this lovely treat for our Deep Bay house. So fitting for the whole adventure of this weekend. We took one last detour to Cape Freels and got another angle of this same iceberg. Thank you Trace for the fun wake up call and the wonderful support over the years. We had so much fun meeting you and we’ll be back! When you get the chance folks, Seize the day. Anyway you spell it, it’s a great motto! Dah-Ling you did a wonderful job on your newest post, both in words and pictures and I particularly loved the videos!! Yes I meant to tell you the sign was for your vacation home but since we think alike I should have known you’d figure that out! 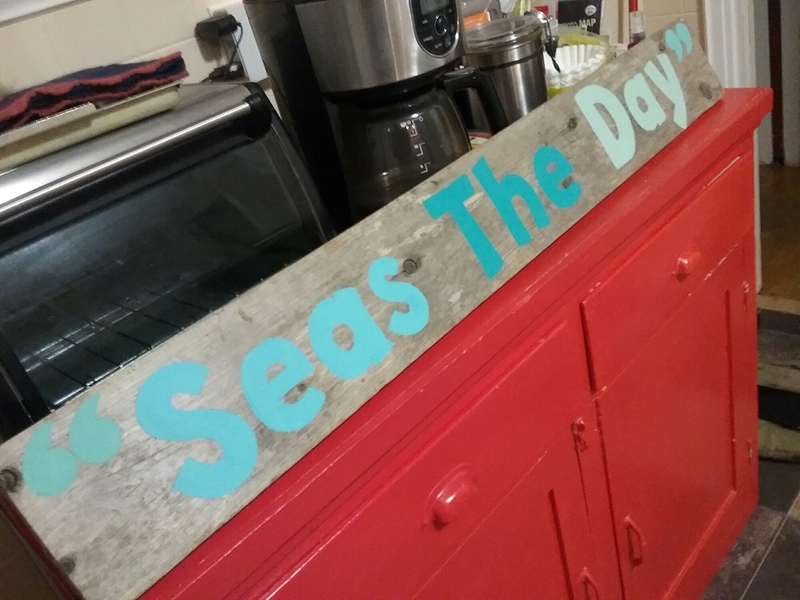 Aren’t you glad you Seas’d the Day?? And i forgot to add your photo!